Don't see products to meet your needs? 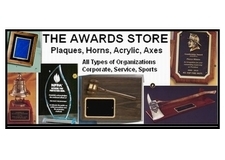 - Call (610-584-4996) for information on extensive line of plagues, medallions, trophies, etc. not shown on this site. Fire, Police, EMS, municipalities, and corporations can fax orders to 610-584-6304. Most service and municipal organizations qualify for instant credit. Credit references may be requested. Individuals and organizations without favorable credit references can use credit card method of payment. Please fax (610-584-6304)or email (Ch835@aol.com) clear and exact engraving information. Names, dates, awards, etc. Engraving charges are included in some product price and not on others. Solid Walnut plaque constructed from American Walnut trees. This is a quality constructed plaque (not composition board) made of solid walnut. Each plaque with precision cut elliptical edge. The finishing on this plaques sets it above the others in regard to quality. Ideal for the award winner of your choice. PRICES ON THIS PAGE INCLUDE ALL ENGRAVING COSTS. Selection of logos to be added to plaques.